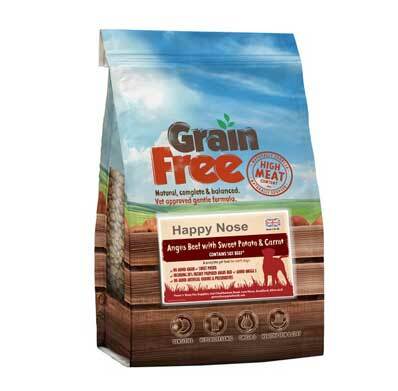 Our Happy Nose Lamb & Rice Natural dog food is now made with a total of 34% lamb inc 4% freshly prepared lamb. 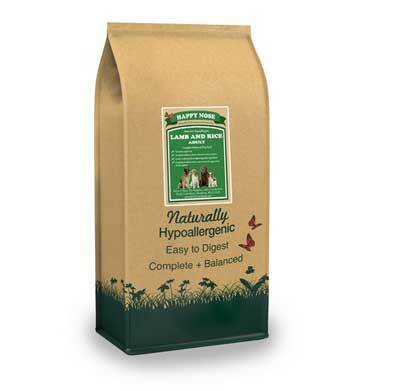 If your dog is allergic to chicken, our lamb variety doesn’t have any poultry fat sprayed on it, everything is from lamb! 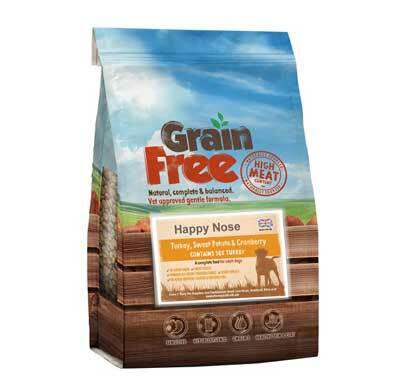 Our Lamb & Rice Natural range is hypoallergenic, therefore formulated without beef, pork, wheat, wheat gluten, dairy, egg and soya. 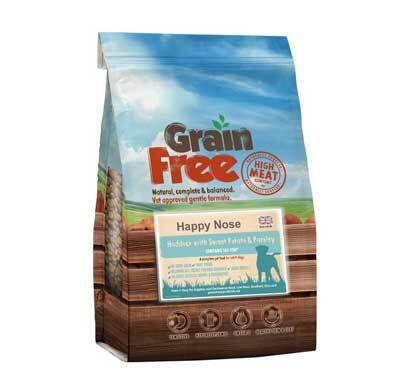 Our Natural range only has high quality meat proteins, therefore no meat and animal derivatives which means that your dog is able to digest more of the goodness from their food. Why Lamb? – Lamb is a nutrient-dense, digestible protein source. It is also a good source of vitamin B12 and Iron which are required to help keep nerve and blood cells healthy. Why Rice? 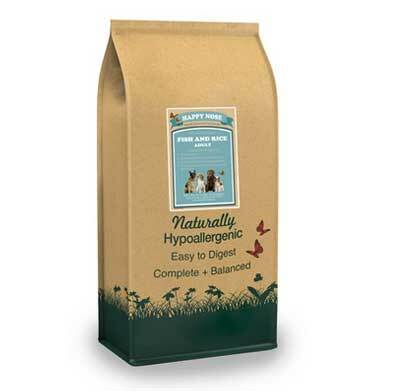 – Rice is an easily digestible carbohydrate source ideal for dogs with sensitive digestion. We have included chicory extract too which may help to promote the growth of healthy gut bacteria and thus aid digestion. No added artificial colours, flavours or preservatives – naturally preserved using rosemary extract. Lamb 34% (inc Dried Turkey 25%, Freshly Prepared Lamb 4%, Lamb Fat 3% and Lamb Gravy 2%). White Rice 15%, Brown Rice 23%, Barley 16%, Linseed, Beet Pulp, Alfalfa, Minerals, Vitamins, Seaweed, Omega 3 Supplement, FOS (960 mg/kg), Chicory Extract (0.05%), Yucca Extract (190 mg/kg), Dandelion. Trace Elements: Zinc (Zinc Sulphate Monohydrate) 50mg, Iron (Iron(II)Sulphate Monohydrate) 50mg, Manganese (Manganous Sulphate Monohydrate) 35mg, Iodine (Calcium Iodate Anhydrous) 1mg, Selenium (Sodium Selenite) 0.28mg. * All dog’s are different and the guidelines should be adapted to take into account breed, age, temperament and activity level of your dog. When changing food, please introduce gradually over a period of two week’s.